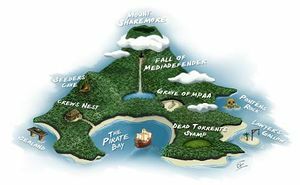 The Pirate Bay (abbreviated TPB) is one of the world's largest piracy groups, located in a naturally defensible cove on the coast of Sweden, from which the organization takes its name. Founded in 2003, The Pirate Bay has seen unrivalled success on the high seas, having grown until it could boast a membership roster of millions of pirates and their ships. The organization is headed by a handful of volunteers who, in their brief bouts of sobriety, assist members with the cataloguing and distribution of stolen goods. Despite its considerable notoriety and the effectiveness of its operations, The Pirate Bay itself is shielded from the wrath of law enforcement and anti piracy groups by operating in such a manner that legal liability is on the millions of individual pirates, instead of the one centralized organization. While this limitation has not stopped these groups from trying to close down The Pirate Bay, none of these attempts have been truly successful, and The Pirate Bay continues to operate to this day. By the end of the 20th century, piracy was beginning to re-emerge on the high seas as people began to realize how much easier it is to steal music and movies than it is to steal salted pork, wenches, gold doubloons, and other traditional targets of pirates. Ships that became targets of pirates were often poorly armed, defended only by fat, sweaty lawyers who waved contracts and shouted to the pirates about the DMCA and someone named Sonny Bono. Pirates were able to raid merchant vessels without serious retaliation until 2001, when the U.S.S. RIAA, a United States Navy battle cruiser, engaged and destroyed the H.M.S. 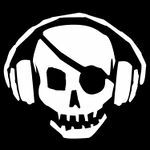 Napster, home to a particularly successful and well-known group of pirates. Pirates would fly flags such as this. The defeat forced the remaining piracy organizations to conclude that the centralized approach to piracy, which relied on a few large command vessels such as the late Napster, would not work; such ships were easy targets for law enforcement officials. For two years pirates sought a way to continue operations without leaving themselves so exposed. The answer was discovered in November 2003, when a then-unknown Swedish piracy group known as Piratbyrån stumbled on a hidden cove while searching for attractive Swedish girls on a beach. The four ranking members of Piratbyrån devised a system that moved responsibility towards individual pirates and away from the organization itself, making it much more difficult to all but eliminate piracy with a single blow. Combined with the naturally defensible secret base, the four believed that they had discovered a way to ensure the continued success of worldwide piracy. After officially opening their new headquarters in the cove, Piratbyrån changed their name to The Pirate Bay, marking the birth of one of history's most successful piracy groups. The Pirate Bay is a vast, well-organized group of pirates who work together to achieve their common goal: redistribution of wealth. The procedures for the piracy itself are generally fairly straightforward, consistent and efficient; because of this, The Pirate Bay has developed a reputation of always being able to satisfy a customer's needs. The acquisition of cargo is usually very simple for pirates. While the rest of the world utilizes more efficient and convenient transportation and distribution systems, groups such as the recording and movie industries continue to be behind the times and ship their goods across seas on old, leaky transports staffed by old-time sailors with peg legs and hook hands. (As these crew members will testify, these crude replacements for human body parts are not particularly effective, especially in a time of real prosthetics.) This makes them an easy target for pirates, who will often board the ship, make off with the cargo, and leave Icy Hot in the captain's shorts. The crew, usually unaware that they have been robbed, sail on serenely while the pirates find a torrent (see below) with which to ship the cargo back to the Bay for cataloguing and storage. 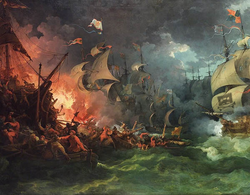 Pirates are well aware that, were they to try shipping cargo across the oceans in vulnerable transports, they would open themselves to the same weaknesses that allow them to pirate in the first place. They instead use nautical phenomena known as torrents to distribute cargo. For unknown reasons, far beneath the ocean flows a large, swift network of currents. As this network coincidentally reaches every major port in the world, including the Bay itself, pirates can use it to easily send cargo nearly anywhere they wish. The currents flow deeply enough beneath the surface (often skimming the ocean floor itself) that most modern anti piracy vessels are unable to even come close to intercepting any cargo being transported through them. A map of the Bay and surrounding area. The Pirate Bay is led by four individuals known as the "Pirate Bay Four" who provide most of the organization's public face. These four handle duties such as press releases, interviews, and deposition by law enforcement as necessary. Subordinate to them are a number of volunteers who take care of the day-to-day maintenance of the group, and the millions of actual pirates form the remainder of the organization's roster. One unique aspect of The Pirate Bay is the manner in which it deals with the storage of plundered goods. Unlike conventional piracy organizations, which utilize warehouses and underground caverns to store stolen cargo, The Pirate Bay requires that each member ship store a small amount of cargo in its hold in lieu of a single large storage system. A complex inter-ship network is used to coordinate the transfer and storage of cargo, which is assigned more or less randomly to different ships. The Pirate Bay itself merely acts as a central authority, or tracker, of that network. This system helps to ensure that law enforcement officials cannot close down The Pirate Bay on the justification that it facilitates theft, as the organization itself actually keeps no stolen cargo. All responsibility is technically placed on the members of The Pirate Bay to abide by all international laws, although this official policy is widely ignored and seldom enforced. The fleet of The Pirate Bay (right) breaking the MPAA's blockade. Since its inception, The Pirate Bay has come under the sights of several private-interest groups, all of which aim to shut the organization down for good. One notable example is a raid that occurred in late May 2006. Anti piracy cruisers and capital ships, led by the U.S.S. MPAA (sister ship of the RIAA), blockaded the mouth of the Bay, stopping all traffic in or out of the piracy base. Immediately after doing so the MPAA openly gloated about the "victory" in a series of press releases, but it was much to their chagrin when, a scant three days later, inhabitants of The Pirate Bay broke the blockade in a short and very one-sided battle. Contrary to its intended purpose, the attack on The Pirate Bay helped fuel public support for the piracy group, as the press releases were circulated on the Internet and the blockade was widely seen as cruel and unusual punishment. In February of 2009, the leaders of The Pirate Bay decided to stage a trial in the Swedish courts and massively publicize it, ensuring that news of the trial reached as many people as it could. The aim of the trial was to stir up public support for the piracy group. The leaders asked Judge Tomas Norström, an old friend and quiet supporter of The Pirate Bay, to fill in as judge in the trial and rule against The Pirate Bay. Norström, glad to help, complied and the trial was carried out in less than a month. When Norström handed down his verdict, public outrage erupted worldwide and supporters flocked to the defense of The Pirate Bay. Proving his craftiness, Norström also managed to leak falsified information suggesting that he was a member of various pro-copyright organizations, fuelling public outrage even further. For those without comedic tastes, the so-called experts at Wikipedia think they have an article very remotely related to The Pirate Bay.